منعم, محمد جواد, قدوسی, حسام. (1393). شبیه‌سازی و بهینه‌سازی عملکرد شبکه‌های آبیاری در شرایط مختلف بهره‌برداری با استفاده از الگوریتم جامعه مورچگان. نشریه آبیاری و زهکشی ایران, 8(4), 654-663. محمد جواد منعم; حسام قدوسی. "شبیه‌سازی و بهینه‌سازی عملکرد شبکه‌های آبیاری در شرایط مختلف بهره‌برداری با استفاده از الگوریتم جامعه مورچگان". نشریه آبیاری و زهکشی ایران, 8, 4, 1393, 654-663. منعم, محمد جواد, قدوسی, حسام. (1393). 'شبیه‌سازی و بهینه‌سازی عملکرد شبکه‌های آبیاری در شرایط مختلف بهره‌برداری با استفاده از الگوریتم جامعه مورچگان', نشریه آبیاری و زهکشی ایران, 8(4), pp. 654-663. منعم, محمد جواد, قدوسی, حسام. شبیه‌سازی و بهینه‌سازی عملکرد شبکه‌های آبیاری در شرایط مختلف بهره‌برداری با استفاده از الگوریتم جامعه مورچگان. نشریه آبیاری و زهکشی ایران, 1393; 8(4): 654-663. به­منظور مدیریت صحیح آب در بخش کشاورزی، بررسی راهکارهای استفاده بهینه از آب در شبکه­های آبیاری و برنامه­ریزی دقیق تحویل آب ضروری می­باشد. یکی از عواملی که در شبکه­های آبیاری موجب پیچیدگی مدیریت آب و کاهش عملکرد می­گردد جریان غیرماندگار می­باشد. منشاء تشکیل جریان­های غیرماندگار در شبکه­های آبیاری بسیار متفاوت است، اما یکی از عمده­ترین منابع تشکیل این جریان­ها اجرای برنامه­های توزیع و تحویل آب در شبکه می­باشد. تنظیم بهینه سازه­های کنترل برای مدیریت جریان­های غیرماندگار و اجرای برنامه­های توزیع و تحویل می­تواند موجب بهبود عملکرد شبکه­های آبیاری شود. 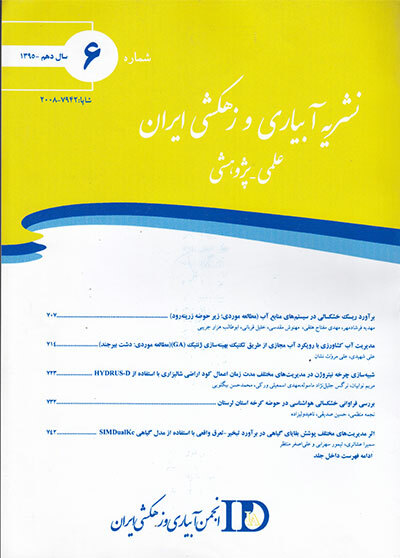 برای این منظور مدل هیدرودینامیک ICSS با روش بهینه­سازی جامعه مورچگان ترکیب شد و مدل ICSS-Ant توسعه یافت. در این تحقیق ابتدا چند گزینه از جریان­های غیرماندگار موجود در کانال E1R1 از شبکه­ آبیاری دز با استفاده از مدل هیدرودینامیک ICSS شبیه­سازی شد و با استفاده از شاخص­های ارزیابی میزان کاهش عملکرد کانال در اثر جریان­های غیرماندگار محاسبه گردید. سپس با استفاده از الگوریتم بهینه­سازی جامعه مورچگان کلیه گزینه­ها در حالت وضعیت بهینه شبیه­سازی شدند. خروجی مدل شبیه­سازی- بهینه­سازی تهیه شده مقادیر تنظیم بهینه سازه­های کانال شامل بازشدگی آبگیرها و ارتفاع آب­بندها می­باشد. In order to determine the Correct optimal Management of Agricultural water, optimum use of water in irrigation networks is necessary. One factor in the complexity of irrigation networks and water management is unsteady flow. Sources of unsteady flow in irrigation networks are different but the most important source is irrigation canal operation. Optimum set of control structures for the management of unsteady flow can improve the performance of irrigation networks. For this purpose The ICSS hydrodynamic model linked to Ant Colony optimization method and the ICSS-Ant model was developed. In this research at first some alternatives of unsteady flow in E1R1 canal of Dez irrigation network simulated and using assessment indexes the rate of canal performance decrease calculated. Then using ant colony algorithm all options in optimal conditions were simulated. The output of the simulation- optimization model is optimal tuning of canal structures involes turnouts opening and and the height of check structures. After optimization result we can see totally the canal performance improved and for other results the reason is ideal condition for initial canal condition. جلالی،م.ر. 1384. طراحی و بهره­برداری بهینه هیدروسیستم­ها با الگوریتم جامعه مورچه­ها، یک رهیافت فراکاوشی جدید، پایان­نامه دکتری، مهندسی آب، دانشگاه علم و صنعت، گروه عمران. کسب­دوز،ش. و منعم،م.ج. 1377. کاربرد مدل هیدرودینامیک ICSS-POM در تعیین مناسب­ترین گزینه توزیع آب در شبکه آبیاری قوریچای، مجموعه مقالات نهمین همایش کمیته ملی آبیاری و زهکشی، صفحه 21-13. محسنی موحد،س.ا و منعم،م.ج. 1381. بهینه­سازی عملکرد بهره­برداری از کانال­های آبیاری با استفاده از روش نورد شبیه­سازی شده، مجله علوم پایه دانشگاه آزاد اسلامی، جلد 44، صفحه 3575-3565. منعم،م.ج.، عمادی،ع.ر و قدوسی،ح. 1385. کمی کردن عملکرد بهره­برداری از شبکه­های آبیاری در شرایط تغییرات نیاز با استفاده از مدل هیدرودینامیک. مجله فنی و مهندسی کشاورزی، جلد 6، شماره 3، صفحه 29-17. Abbaspour,K.C., Schulin,R., Van Genuchten,M.T. 2001. Estimating unsaturated soil hydraulic parameters using ant colony optimization. Advanve Water Resource., 24:8. 827-841. Arnet,R.H. 1985. American insects. A hand-book of the insects of America north of Mexico.Van Nostrand Reinhold Co. New York. Bullnheimer,B., Hartl,R.F., Strauss,C. 1999. A new rank-based version of the ant system: A computational study. Central European Journal for operations Research and Echonomics. 7: 1. 25-38. Colorni,A., Dorigo,M., Maniezzo,V. 1991. Ant System: an autocatalytic optimization process. Technology Report., 91-016, Politecnico di Milano, Italy. Cordon,O., Fernandez de Viana,I., Herrera,F., Moreno,L. 2000. A new ACO model integrating evolutionary computation concepts: the best-worst ant system. In proceeding of ANTS’2000-From Ant Colonies: Second International workshop on Ant Algorithms, Brussels, Belgium, pp 22-29. Deneubourg,J.L., Aron,S., Goss,S. 1990. The self-organizing exploratory pattern of the Argentine ant. Journal of Insect-Behaviour., 3:159-168. Dorigo,M., Gambardella,L.M. 1997. Cooperative learning approach to the traveling salesman problem. IEEE on Evolutionary Computation. 1:1. 53-66. Grasse,P.P. 1959. La reconstruction dun id et les coordinations interindividuelles chez. bellicosttermes natalensts et cubitermes sp. La. theorie de la stigmergie: essai d’ interpretation du comportement des termites constructeurs, Insects Sociaux 6:41-81. Kanooni,A and Monem,M.J. 2013. Integrated stepwise approach for optimal water allocation in irrigation canals. Irrigation and Drainage, Published online in Wiley Online Library. committee, 13-21. Manz,D.H. 1985. System analysis of irrigation conveyance system. Thesis as a Part of the Requirements of Doctor of Philosophy in Civil Engineering, University of Alberta. Canada. Molden,D.J and Gates,T.K. 1990.Performance measures for evaluation of irrigation water delivery systems. Irrigation and Drainage Engineering.,116:6. 804-822. Monem,M. J and Schuurmans,W. 1992. Performance of canal delivery strategies. International Seminar on the Application of Mathematical Modelling for the Improvement of Irrigation Canal Operation, 26-29 Oct. 1992. Montpellier, France., 307-315. Monem,M.J. 1996. Performance evaluation and optimization of irrigation canal systems using genetic algorithm. Ph. D. Dissertation, department of Civil Engineering, Calgary University, Canada. Sothea,H., Malaterre,P.O., Belaud,G and Dejean,C. 2014. Optimization of water distribution for open-channel irrigation networks. Journal of Hydroinformatics, 16:2. 341-353. Stutzle,T., Hoos,H.H. 1997. The Max-Min ant system and local search for the traveling salesman problem. Proceeding of IEEE-ICEC-EPS. pages 309-314. T. Baeck, Z.